We are engaged in manufacturing, exporting and supplying of Semi Automatic Case Making Machine. The image graph Semi Automatic Case Making Machine is idle for making cases using Hot or cold glue. The Semi Automatic Case Making Machine consists of gluing station, board placement device with suction, turn in station and pressing station. Glue station is equipped with in-direct heating for hot & cold glue with facility to add water which evaporates due to heat. 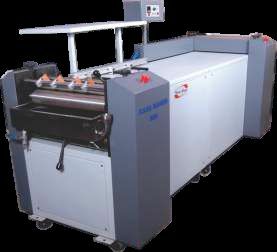 We supply durable, efficient, sturdy and reliable Semi Automatic Case Making Machine at fair prices.